I am over yesterday and gearing up for a kids halloween party tonight. I think I will be the wicked witch of Gellibrand. Spent more time exploring lace yesterday. I have posted photos of my great aunts and uncles on my fathers side of the family ( oh and if you click on the photo a larger version comes up) and they like my great grandmother are dressed in the costume of the islands of southern Holland known as Zeeland. Their mutsen are rather more austere and this is likely to be due to the fact that they lived in a fairly tight hugeunot community in Walcheren. I like the fact that the men wore ornament as much as the women and I remember my grandfather had pierced ears because the men also wore ear rings. 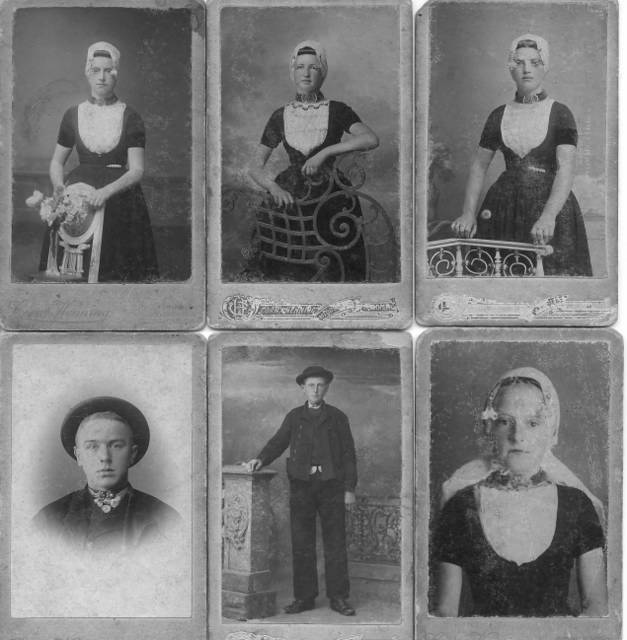 The young woman in the bottom right has a long lace cap- this indicates that she was unmarried. 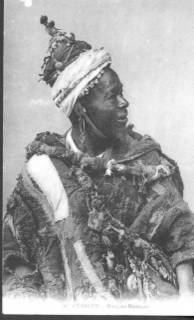 The mutsen told much of a woman's standing and place in the community and were a type of code in a sense. 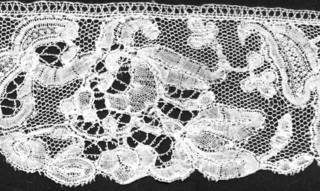 The drochel lace is from the eighteenth century which I purchased in Brugge ( the Venice of the North). I bought this lace ,as it was likely to have been worn by the women in my families- this particular piece was all I could afford but it is quite fine linen which is of course why Belgium was the centre of much lace making- the water in the rivers was conducive to the right sort of fermentation of the flax to produce fine linen. Yesterday was such a disheartening day that I walked around my garden this morning and tried to kick start or revive some spark of creativity. I hate the jousts with bureaucracy that bring me home deflated with the knowledge that we are too poor. And then I look around my garden and see the wonder of the weird and wonderful shapes of the native flowers in my garden. 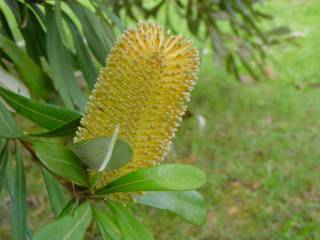 We planted a corridor for birds and planted many natives, and my favourites- banksias. 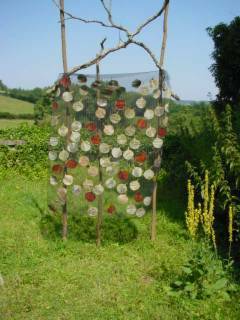 The knobby seed pods are a constant source of facination and have inspired many artists and writers alike. There are children's books dealing with banksia men that focus on their monster like protrusions and their hairy pods. There are people who have made "elf"people into the hollows of the pods. I love the change of colour from the darkness of the interior of each individual seed pod to the lighter rings of the lips of the pod. Many banksias will only seed after fire, or as in this case where the seed pods do open the seeds will only germinate after fire. 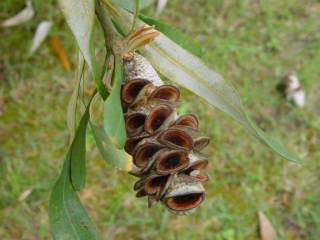 The seed pods and the banksia flower are on the tree at the same time. I love the delicacy of this particular flower as the stamens seemed topped by delicate pearls. 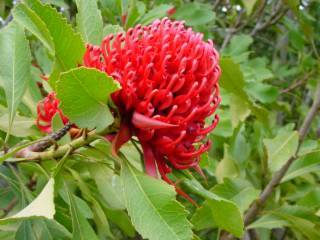 And the waratah- is just big wah me- so in your face so wonderful. I am in my last year of finishing a masters in visual and performing art at Charles Sturt University.I started with the idea that I would be making quilts exploring the experience of immigration and I struggled to conceptualise this idea. I did write a small book dealing with what I remembered of the experience as a 9 1/2 year old child- but how do you translate that? 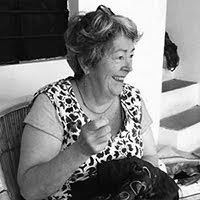 But as I started to look further, and after reading a book by Eva Hoffman entitled Lost in Translation- Life in Another Language , the issue that became important was the 'difference' of being Australian and Dutch and what did it bring to the melange? It started me on a totally different tack. I started looking at photos of my family- I studied the photos to try and discover something that I could visually explore. 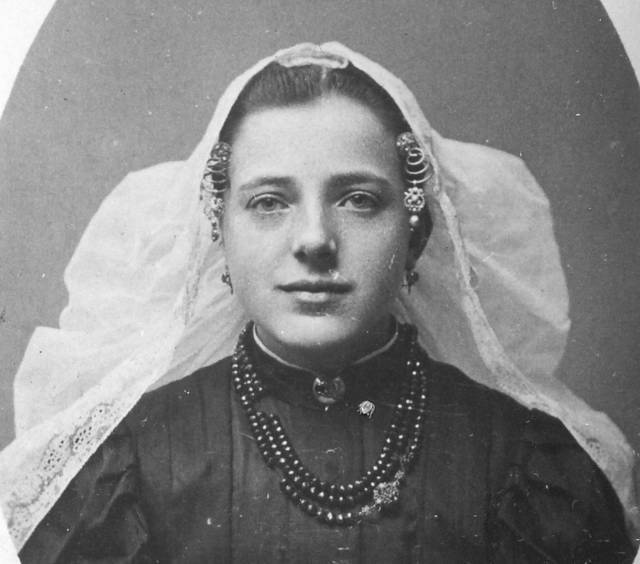 The costume that my great grandmother is wearing is interesting of itself but it was ultimately the lace that spoke ot me, that gave me an avenue for exploration. The lace says so much of the life of this person, so I am wanting to make lace that carries that kind of communication- I hope. A few days ago in talking about the "rough" stitching of the griots coat I talked about the mark making qualities of the stitch. June Underwood suggested I should take some now and later photos , which I have done. The first image is done with quite coarse knitting thread that I bought in a Dutch market and hand dyed. 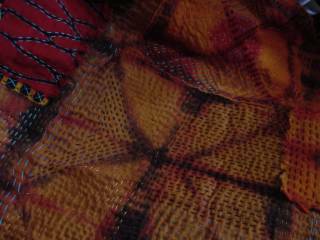 I like the effect of the coarseness of the thread and the uneveness of the dyeing also lends to the sense of texture. 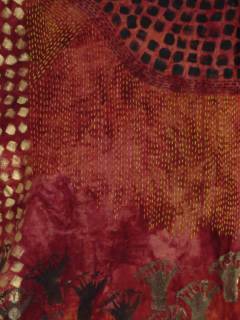 The second photo is a detail of a piece inspired by kantha embroidery. 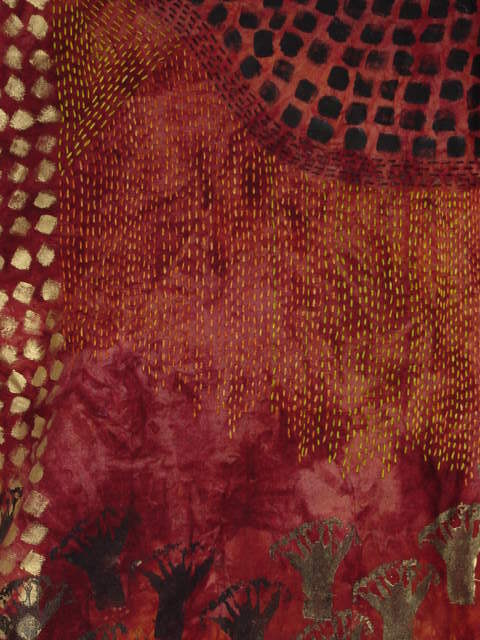 Kantha embroidery is practised by women in the bay of Bengal area and is largely used to patch together saris and dense stitching in order to strenghten the fabric thus created. They tend to use only running stitch and I love the narrative touch of the stitching by the women.I want to work on ways to make my stitching more expressive, more like communications from my inner self instead of the neat rows that I seem to be now producing. When I travel , I always try and see a new place or revisit a special place amongst the work. Venice has to be one of the most special places I have been to, and 2 years ago in very early March I encountered a perfect day in Venice. The morning was misty and cool, there were few tourists around , and as the day grew the sun shone to make the day magic. Viewing Tintoretto's in the Galleria dell'Accademia was a special delight whilst a tenor outside delighted people with his voice. One of those delightful Italian sort of days,punctuated by pasta and a glass of wine for lunch, and lots and lots of walking. 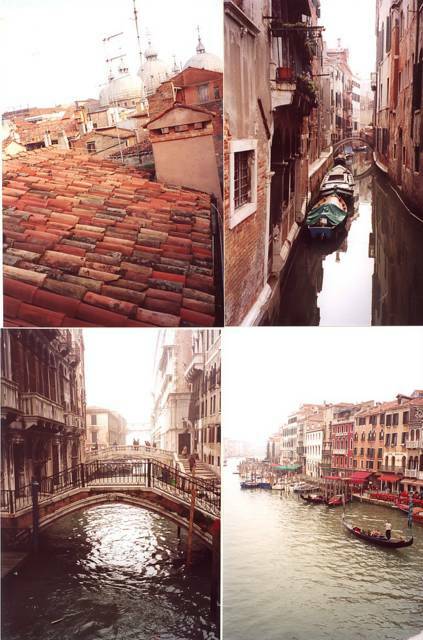 I would love to make textile pieces inspired by Venice- but where do you start to even grab the atmosphere of this wonderful city? This photo shows a page out of my journal in which I tried looking hard at the griot postcard and seeing what I could see. Obviously the rough stitching attracted me- they are so expressive, and so much the voice of the maker of this coat.It lead me to thinking how do you use stitch and how can you make perfectly ordinary stitches like running stitch be expressive and a mark making tool as hand writing and drawing is? My stitches are always reasonably neat, though big- is the neatness how I mark make? and if it is what does it look like? Does it convey anything other than neatness? Is the espressivenss of stitch determined by rhythm- I certainly can see a rough rhythm in the stitching of the griots coat- but it is a syncopated and improvised to suit the need. 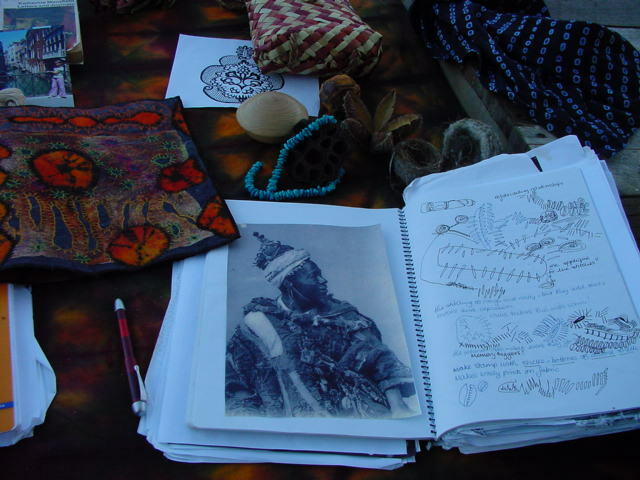 How do you carry that lesson into your own work and what rhythms lead my hand? I am having trouble focusing since my last lots of travels and really I need to be having my head down and making lace for an exhibition in February. Meanwhile I keep making more bookcovers out of scraps of material that I found lying in my workroom and which will hopefully re-enthuse me. I have vliesofixed fabric onto momogami paper- this creates a sturdy leather like surface with which to stitch. Poor Japanese workers used to wear momogami because they could not afford the more expenisve fabric. The method creates soft covered books, and I like the feel of soft covers. 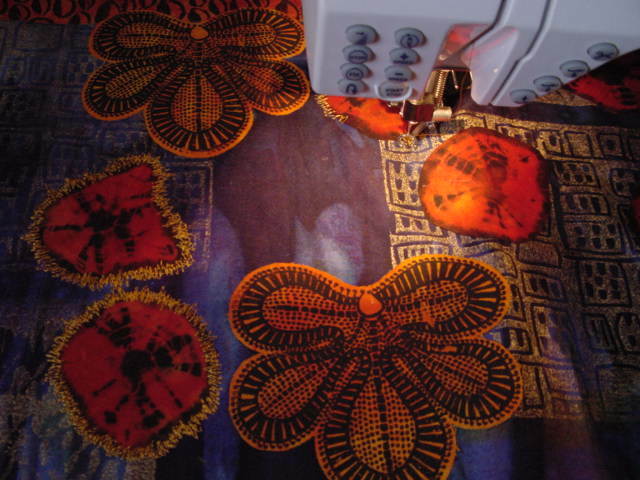 I stitch in detail with the machine and contrasting thread colour to try and add to the dynamics of what is essentially scraps thrown together. The printing you can see is done with lino-cuts. This last winter I spent more than 15 weeks on the road. Whenever I can, I try to visit Chateau de Chassy in the Morvan in France. I took this photo of a piece of "lace " I have been working on . In the background the triangular field that is immmortalised in a painting by Balthus who lived at Chassy in the fifties and early sixties. 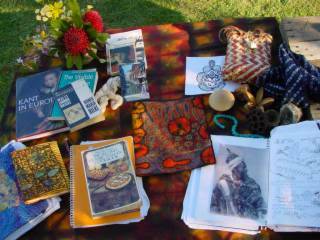 If I could have a perfect desk perhaps it wouldlook something like this. I have finally taken the plunge to start a blog. It will be peripatetic as my life is. I travel, to teach and curate exhibitions of contemporary quilts which I occasionally take to Europe. I spend chunks of my life travelling with exhibitions loaded into my suitcase and two sets of clothes- can't fit more than that!When I come home again I need to regroup, so I often start by making things which are manageable in a day- hence the bookcovers, and I trawl through the books that offer inspiration- to get going again- and as I have a family I need to do some cooking too!